The mind is a funny thing. And the moments it chooses to catalog for life baffle me. I know very well that the snippets of your childhood you’ll remember will be random and plentiful at best. And scattered and sparse at worst. But if I had the power to help you preserve the memory of a moment, for life, it would be one such as this. 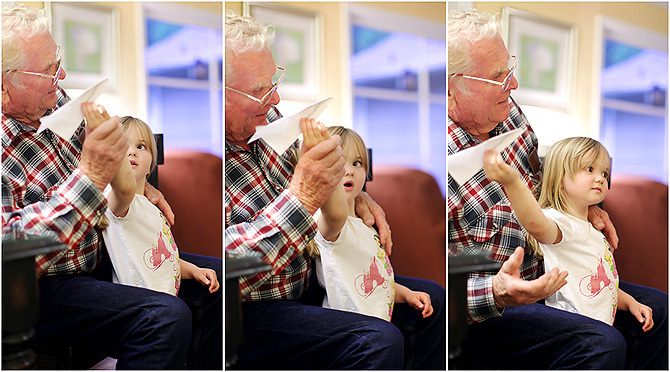 The feel of your great grandfather’s warm, weathered hand as he teaches you to launch your first paper airplane. I hope this is a memory for life. But if it’s not for you, my girl, it certainly will be for me. And I promise I’ll share. Oh, you have me all teary eyed over here. Your kids are lucky to have you as their mom and they will cherish all of the memories you have helped preserve for them one day. I forget how I stumbled across your blog, but I love it. Your pictures are so fabulous. I love the feel and style of them all. I am taking my first photography class right now online and loving it! I am obesessed with learning as much about photography as I can. I loved the pictures of you workin with Karen too. Those were all really neat. And the ones with Great Grandpa… priceless. Nice meeting you in blogland! There you go again…making me cry. You have such a beautiful way with words. Your daughter will be so proud to have these memories one day. The memories in these pictures (and the pictures themselves!) are priceless! It’s just before 6am here and I’m fighting back the tears. What a lovely memory! And I love Sarah’s sideways glance in the second set. Truly lovely. I’m glad I was in the room when this series of pictures was taken. That’s my daddy! Tears flowing. Thanks, Deed. Beautiful and so precious! Your children are so lucky they will always have something to remember these special moments! LOVE these moments that are now saved for her when she is grown! I have such scattered snippets of memories of my grandparents as a child. I don’t capture enough of these moments of my own children with their only great grandma or their grandparents. Thank you for reminding me I need to do better at that. fabulous photos, but the memory you captured here is amazing. Thanks for the reminder to enjoy the special small moments. Also makes me long to be able to move closer to my kids grandparents, we do not get to see them often enough. What a beautiful set of photos… perfect storytelling as always! 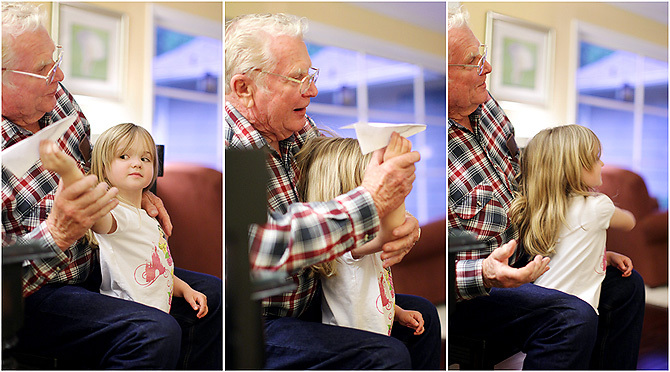 Absolutely lovely images of a moment in time that I’m sure she’ll cherish many years from now, if not tomorrow, too. I’m thankful that Karen Russell introduced me to your work. I have something new to aspire to. Thanks for sharing your work and life with us. This seriously made me cry. I so miss my grandfathers’ worn hands, both of the one who has passed on and the one who is too far away. What a wonderful thing to capture for your daughter! I too, love seeing this photo. As we grow older, life seems to go by so quickly…why I wonder? But while we are here and before out loved ones, it is best to invest in the time we have with them. Thanks for letting us all veiw what is most important in your life and sharing the words of wisdom. Erin, I have recently discovered your blog through Karen Russell and you were instantly added to my ‘check every day’ list. Your pictures are amazing! Your stories are heartwarming, and I love your comment about sharing this moment with your daughter if she forgets…isn’t that why us moms do this documenting in the first place? People like Papa John become indelible in your memory!! PRICELESS!!!!! LOVE these so MUCH! Is there any word better to describe that moment than “awwww”? this might be my favorite post of yours! so sweet!! You have captured such a tender and sweet moment for all generations. You mentioned his hands on hers, and it brought a memory of an email I’ve seen where a photograph was taken of like four or five generations of hands. You have the know-how to capture just such a picture of all of you. I too have found you from Karen’s blog, and I am here to stay. Erin – What a beautiful post. I am a scrapbooker and this IS exactly why I scrap. Not just for my daughter though. I have a horrible memory, so I scrap for me too, so that I also can remember all of the little things that life holds so dear. I know you soooo do not have time to answer questions from annoying blog readers like me. But, I am contemplating the Canon 85mm/1.8 and wondered….Do you use a lens hood? Do you recommend using one? I have never used a lens hood and wondered what your opinion is! Well crap!!! I jumped over here to link your blog to my PAD for tomorrow and now you’re making me all teary eyed. Good thing I got my story done before I read your blog since it’s about Ephraim and grumpa. so simple – yet so beautiful. thank you for sharing.